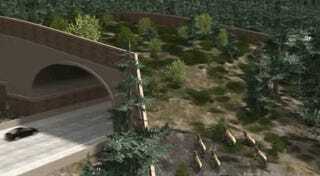 Construction begins today on Washington state’s highly anticipated wildlife overpass. Construction begins today on Washington state’s highly anticipated wildlife overpass. Measuring 150-feet long (45 meters), the bridge will allow bears, cougars, elk, and lizards to cross over the busy I-90 highway. It’s a “critical connective link” that’s expected to dramatically reduce collisions between vehicles and animals.